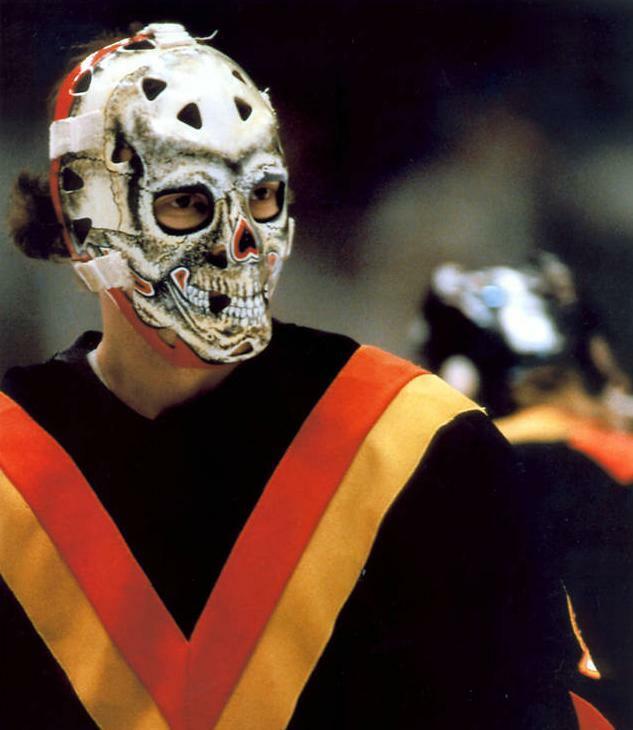 LUONGO — Who Was That Masked Man Anyway? Roberto Luongo went from the chosen one, to the scapegoat to the martyr. How will he be remembered in Vancouver? Never has there been such a divisive force in Canucks history. When Canucks fans think of the best goalie to ever wear our colours, the statistics would indicate that it was always Roberto Luongo, but when Canucks fans think of Canucks who have given service to the team and community, other names come to mind: Trevor Linden, Daniel and Henrik Sedin, Markus Naslund, Stan Smyl, Kevin Bieksa, Alex Burrows, Kirk Mclean. Now that a couple of weeks have elapsed since the biggest trade in Canucks recent history since, perhaps, the trade to acquire him, Roberto Luongo’s legacy is worth considering. Just what is it that he contributed to the Vancouver Canucks and our community and did he truly bleed the Canucks’ colours? In his later years with the team, Luongo became a caricature of himself as “strombone1” took over. For such an important player, it seems his worth was all related to the ups and downs of what ensued on and off the ice. This is not to take anything away from Luongo’s time with the Canucks own charitable work with Canuck Place, his sponsorship of a box at Rogers Arena for underprivileged children to watch games and his patience overall with a Vancouver fan base running on anxiety and post traumatic stress from narrow losses in two of three Stanley Cup Finals, for in that sense Luongo has been pulling the company line. But, when someone’s heart isn’t in it, it just isn’t in it and, other than the time leading up to the 2011 run, Luongo’s heart hasn’t been in it, let’s face it. Fans are quick to point out that this is a mess created by Gillis, and in that respect I agree. There was an opportunity to make Luongo a longtime Canuck by simply challenging him to accept a fair contract for market value and typical terms, rather than a lifetime contract, with too many guarantees and the unorthodox granting of the captaincy role to a goaltender. Mike Gillis would surely take that one back beyond any contract he’s signed. Ever since that day, there has been a slow erosion in the relationship between team and player which led the team to trade him back to Florida for virtually nothing. Many Canucks fans will cite the Schneider and Luongo controversy as the beginning of the end. But, still, the question remains “why Florida?”. Here the player is to blame for where his heart truly lies, in every sense of the word “lies”. It is understandable when Cory Schneider looks like the next real deal that Luongo wants to be traded to a team with at least a playoff opportunity, but now that Florida seems destined for lottery picks for at least the next two seasons, the limitation in destinations appears like a lifestyle choice over a career move. The brighter sunlight and dimmer media lights seems suited for a goalie whose battered confidence is in need of low-pressure easy street for a while. Florida offers friends and family, a warm place to read a paper on a sun deck and expectations that are non-existent — a far cry from Vancouver, where the inhospitable winter months, with weeks of rain and sleet in the four hours of daylight are a metonym for the narrow and grim focus the city attains for their beloved Canucks. Living in Vancouver every day of one’s existence isn’t as easy as it looks in the sunny pictures. You have to have a methodical and hardened type of focus to make it through those months, a type of focus that would allow one to, say, survive an onslaught of seemingly insurmountable pressure when what one would rather do is be in a sunny destination relaxing with a Mai-Thai in a swimsuit. Luongo’s legacy… can’t keep his mouth shut. In the end, Luongo will be remembered for a number, the number “1”. “1” as in one raised arm to inform the referee about a penalty as Corey Perry blows an easy one by him in overtime of the 2007 Stanley Cup playoffs. One bad contract and one bad decision to make him the sole captain of the team. One Stanley Cup finals run during which the team lost by one game. One bad trade to the one team he wanted to go to in the one market that doesn’t care whether there’s an NHL team or not in their city. One gold medal… not two. One larger than life player, riding a fine line on social media as “strombone1” who couldn’t put the team on his back the one time they needed him to in the one game that meant the most for the franchise. One bad decision after another, Luongo wasn’t sent to Florida because it was a good trade. He was sent there because everyone needs to move on from one weird era of Canucks history.